The most ambitious of three different proposals to fly a Gemini by the Moon, all made during the Gemini’s short heyday of 1964-66. This version of the capsule would have been mounted on an Agena-D rocket stage that could brake it into Lunar orbit and then send it back to Earth. The Gemini/Agena in turn would have been mounted on a Centaur for the initial trip from Earth orbit to the Moon. Image from Gemini Applications for Lunar Reconnaissance. Click for larger view. What it was: A series of 1964-65 proposals to use the Gemini capsule as the core of a manned Lunar flyby mission, or even a Lunar orbiter. Details: NASA was committed to the Apollo spacecraft for journeys to the Moon, and had begun development on it before work began on the Gemini. At first Gemini had been intended solely to build on the Mercury program (it was originally named “Mercury Mark II”), as a way of giving astronauts practice in the orbital docking and spacewalking techniques they’d need for the Apollo missions. Jim Chamberlin did try to sneak two circumlunar flights into the original Gemini plan of August 1961, but they were gone in a week; he’d try again with a Gemini Lunar lander in 1962, and still get nowhere. In essence the program was just supposed to fill the relatively short time between the last Mercury flight on May 15, 1963 and the flight of the first, unmanned Apollo sometime in 1966. But then the Gemini proved itself to be a capable little spacecraft. From March 1965 to November 1966 it was flown on twelve missions with only one partial failure, Gemini 8. Both McDonnell Aircraft (which made the Gemini capsule) and Martin Marietta (which made the Gemini launcher, the Titan II GLV) had been shut out of Apollo and so they set about making the plausible argument for a Gemini Lunar flyby again rather than have NASA trust entirely to the as-yet untried Apollo spacecraft. And so it was that one proposal from McDonnell dropped on to NASA desks in April 1964, shortly after the first unmanned Gemini flight. Another came in from Martin Marietta in July 1965—right in the middle of Gemini’s successful run. Both were based on the premise that the Moon landing was going to happen with Apollo no matter what they said, but that a prior Lunar flyby was still an open question. The alignment for the Earth, Sun, and Moon for the flyby mission that would give maximum coverage of the Lunar far side while also allowing photography of the proposed Apollo landing on the Sea of Tranquility. 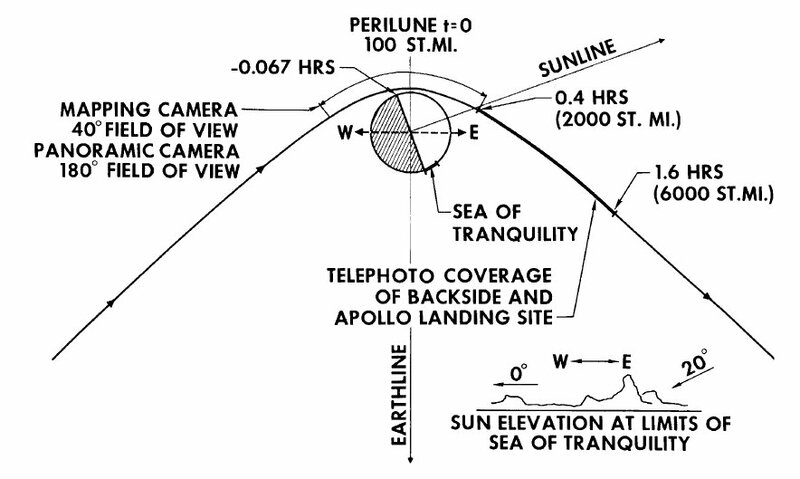 Image from Gemini Applications for Lunar Reconnaissance. Click for larger view. McDonnell’s proposal was actually three wrapped up into one, unified by the goal of performing Lunar reconnaissance for the Apollo landings. The least ambitious of these was a single-flyby spacecraft made up of a modified Gemini capsule, the base of which was mated to a Centaur rocket stage. By not loading the Centaur entirely with propellants this arrangement was just light enough that a Saturn IB could lift it into Earth orbit while still providing enough propulsion to send it on a free-return trajectory around the Moon. There it could either focus on photographing the Sea of Tranquility while also photo-mapping the Lunar far-side to an extent, or alternatively it could look at those two targets with the opposite priority. In return for getting only one pass at the Moon and having to cut down on the amount of fuel the craft carried, this proposal had the advantage of being a single-launch, no-rendezvous mission. Next, McDonnell proposed two missions that used two launches instead, but with the compensating advantage of putting the craft into Lunar orbit so that much more mapping was possible. The first put the Gemini—with a modified service module—base down onto an Agena-D rocket stage, a combination that could be launched into low Earth orbit together by a Saturn IB. A second Saturn IB would be used to send a Centaur rocket into orbit, and then the Gemini/Agena would dock nose-first into it. The Centaur would fire and send the Gemini/Agena into a translunar trajectory, then separate once its propellant was spent. 68 hours later the Agena would fire and bring the ship into a 150 × 20 kilometer Lunar orbit, with the perilune arranged over the proposed Apollo landing site so that it could take extremely high quality photographs of the area. After 24 hours of orbiting the Moon and shooting pictures, the astronauts would fire the Agena again to head back to Earth. There the Gemini would separate from the spent rocket stage and splashdown, returning the crew home just shy of a week after they left. The second of McDonnell’s orbital proposals was quite similar, the major difference being that instead of using an Agena-D as the Lunar orbital and return stage this version had a massively altered service module carrying its own engines. There’d be extra development time and money needed for this version of the mission, but in return it saved almost 700 kilograms in launch weight to supplement the thin margin for error involved in launching the Gemini/Agena combination aboard a Saturn IB. A bit more than a year later Martin Marietta moved in with their proposal. As the manufacturer of the Gemini’s launch vehicle, their idea didn’t have anything to do with a Saturn rocket. This was a real problem as Martin Marietta launchers could at most, assuming a Titan IIIC with its strap-on boosters, lift some 13,100 kilograms into orbit (contrast that with the Saturn IB’s 21,000kg). Accordingly there were no Lunar orbiters here, and even the Lunar flyby required two launches. Of course from Martin Marietta’s standpoint this was not a problem: they were more than willing to sell NASA two Titans if that was what it took. In fact they even managed to work in a third. 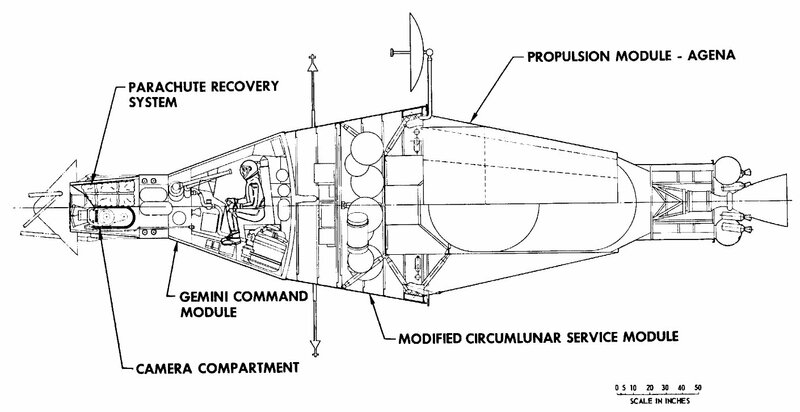 Not only would the Gemini launch by itself on a Titan II GLV and the Lunar injection stage on a Titan IIIC, the injection stage itself was not an Agena or a Centaur, but rather another stripped-down Titan III upper Transtage (its specific name, confusingly enough, since it’s just one example of a trans-stage used throughout the years) mated to an Agena docking adapter. The Gemini docked to the Titan Transtage that would push it into a flyby orbit. Note how the astronauts had their backs to the direction of travel; in contrast to the Lunar orbiter shown above, the Gemini flyby missions pushed the capsule backwards to its destination. Image from Rendezvous Concept for Circumlunar Flyby in 1967, Click for a larger view. Despite the different equipment, this meant that the mission they proposed was essentially a recapitulation of Jim Chamberlin’s 1961 proposal—one presumes that they were hoping that the at-the-time recent success of the Gemini and the Titan II GLV would override James Webb’s veto. If it did and the mission flew, the idea was to launch the Transtage and the Gemini within a few minutes of one another (or, if absolutely necessary, launch the Gemini after the trans-stage had made most of one orbit and was coming back over Cape Canaveral). After maneuvering their capsule into the vicinity of the Transtage the astronauts would dock their Gemini nose-first to it and then use it to fire them into a free return orbit around the Moon. Perhaps because they’d heard nothing encouraging back from NASA in the year since they’d made their own proposals, McDonnell backed this mission too; the pair even managed to rope in Pete Conrad, who would soon fly on Gemini 5, to advocate for them in a meeting with NASA’s top people on June 24, 1965. Like the earlier McDonnell proposals, Martin Marietta aimed to perform the Lunar flyby sometime in 1967, in April to be precise, and do it for US$350 million. What happened to make it fail: McDonnell’s proposals likely went nowhere because they backed the wrong horse when they pitched them as Lunar reconnaissance missions. NASA already had plans for site mapping using the Lunar Orbiters and even a back-up plan using Apollo, the LM&SS. The latter was actually handled in part by Lockheed, and so it’s unclear why they thought NASA needed a back-up for the back-up. Martin Marietta’s attempt failed for a more fundamental reason. They quite astutely positioned theirs as a spectacular, primarily for the purpose of beating the Soviet Union to a Lunar flyby. This was bound to pique some interest because at the time NASA’s attitude was that they were going to lose that particular race; the Moon landing had been specifically selected in 1961 as the first major one that the US could definitely take from the Russians. In the actual event it turned out that the Zond program was in trouble and Apollo 8 would take this particular laurel, but hindsight is 20/20. As a result, NASA was supremely focused on Apollo and the Moon landing. In stark contrast to the shambolic Soviet program in the mid-60s, they picked their goal and their program and they stuck to it. While there was some late sentiment for an early flyby with a Gemini, NASA’s upper management felt it would be a distraction. There was only so much money and, more importantly, so much engineering talent in the organization, and looking away from the Moon landing to anything else was just going to delay their final goal. They were willing to give up a Lunar flyby if it got them the manned Moon landing instead. History, in both the American success with Apollo and Soviet failure with their equivalent of the Gemini Lunar Flyby, Zond, suggests that they were right. What was necessary for it to succeed: Any of these missions could have flown if it had been only a matter of technical specs. Their margins for error were slim, and there was a good chance that they would have lost a crew, but all four possibilities were well within NASA’s capabilities. Some organizational impulse toward flying them was all that was really necessary. Ultimately it comes down to the fact that NASA had conceded the Lunar flyby race to the Russians already, and felt no need to go all out for one. If they beat the Soviets with an Apollo flyby, so much the better, but they weren’t going to deviate from that plan. It likely would have taken considerable external political pressure to cause a deviation—how you generate this is up to you. While Pete Conrad was able to fire a little interest for the Gemini flyby in Congress in the real world, James Webb was able to tamp it back down again. Conrad did get one little victory out of his advocacy for a Lunar flyby. When he flew his second Gemini mission, Gemini 11 in September 1966, his goal was to dock with an Agena—as was usual in Gemini rendezvous tests. Conrad was, however, given permission to use the arrangement to boost himself and Richard Gordon to an apogee of 1369 kilometers. It was a miniature version of the mission he had wanted to fly a year previous, and set the record for a human being going furthest from the Earth. Apart from the Apollo missions to the Moon that followed, it still holds that record. This entry was posted in Sputnik to Moon Era and tagged flyby spacecraft, gemini variant, lunar flyby craft, manned space programs, on paper only, space capsule, united states by Paul Drye. Bookmark the permalink. I trust the Big G proposals are on your list.